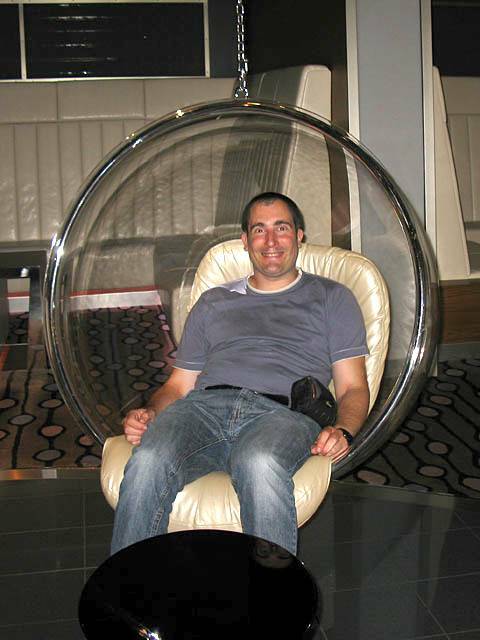 Click here to return to the main General 2012 Pictures Page. 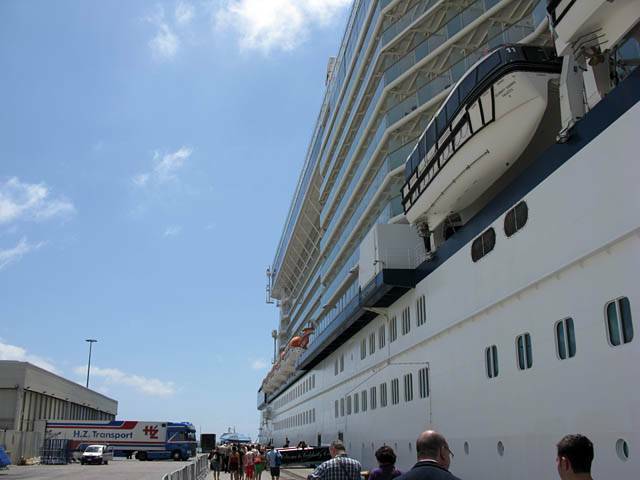 Click here to go forward to Cruise 2012 Day 1. Below are pictures of the route map. This map was shown on a big board near the Oceanview Café, and another board near the Silhouette restaurant. I split it into 3 pictures for the best view of the route. It was difficult to get decent shots without a tripod or a flash. But these should be readable enough to see exactly where we went. 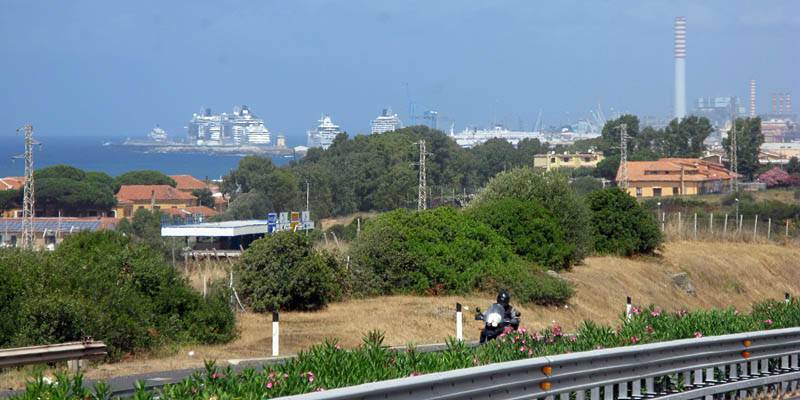 The Western portion of the trip between Civitavecchia and the Ionian Sea. 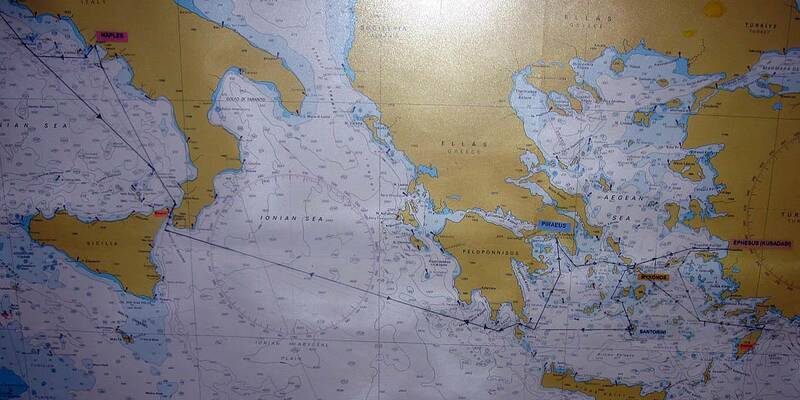 The Eastern portion of the trip from the Eastern side of the Ionian Sea and the whole of the part of Aegean Sea that we sailed in. 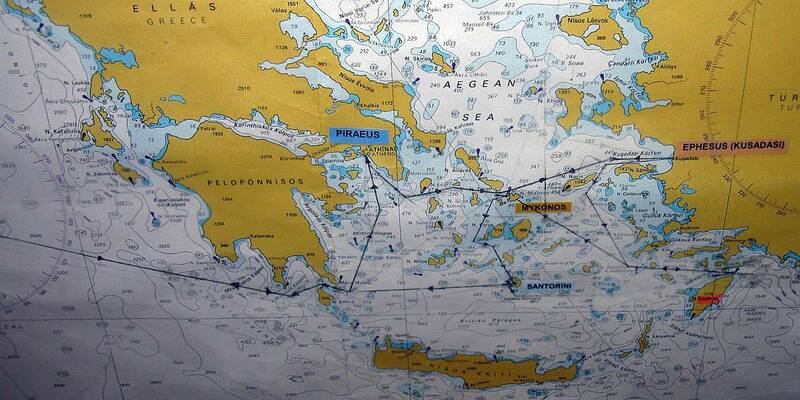 We more or less did a clockwise tour within the Aegean Sea. 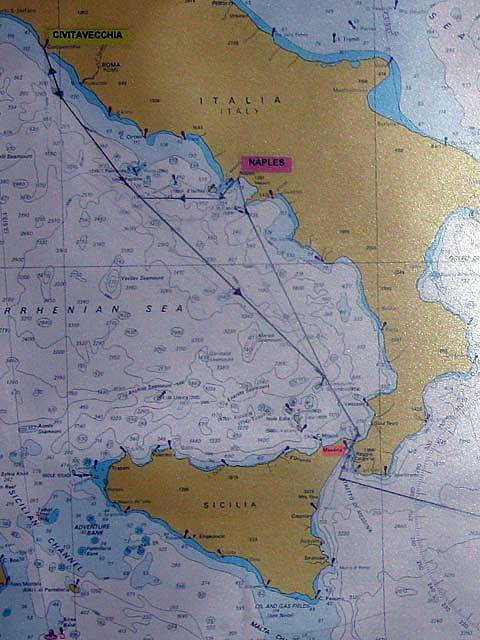 A wider view of the trip from Sicily Eastwards across the Ionian and Aegean Seas. 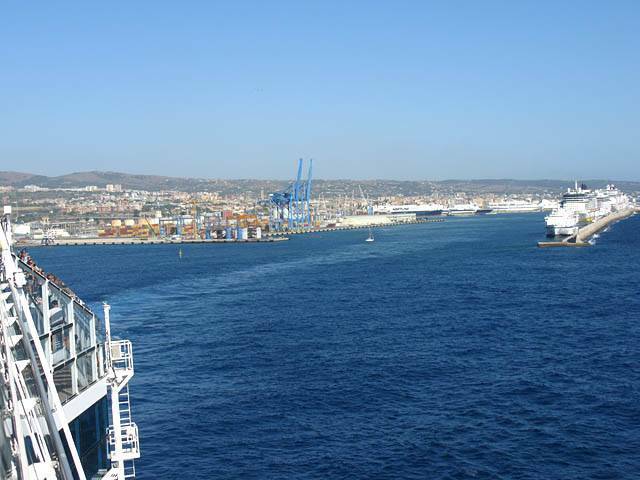 You can see how in the At Sea days crossing the Ionian Sea we were in the middle of a big blue disc from horizon to horizon. We had an early 3:50AM start in Hendon. I didn't sleep well but never mind. Dad turned up early at about 4:05AM. We were ready at 4:15AM and had a smooth ride to airport in damp conditions. The plane was on time. Going through customs I had forgotten that suntan lotion and deodorant were classed as liquids and I had them confiscated! Atleast I was able to get more at boots in the duty free area. 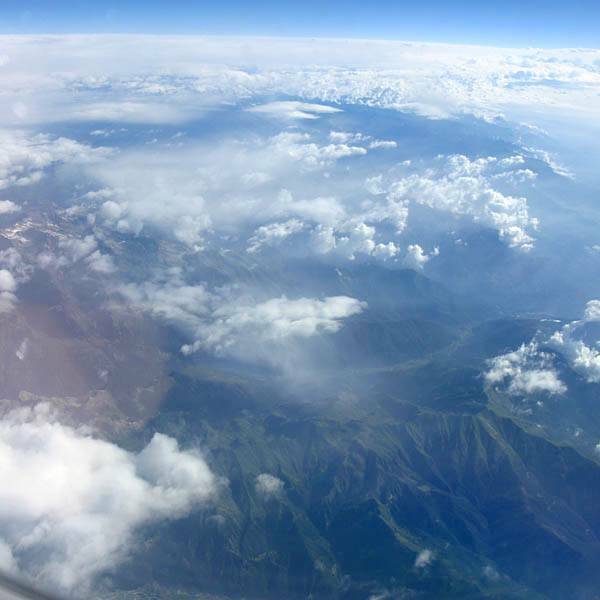 The plane was an Old and dirty Airbus A310. 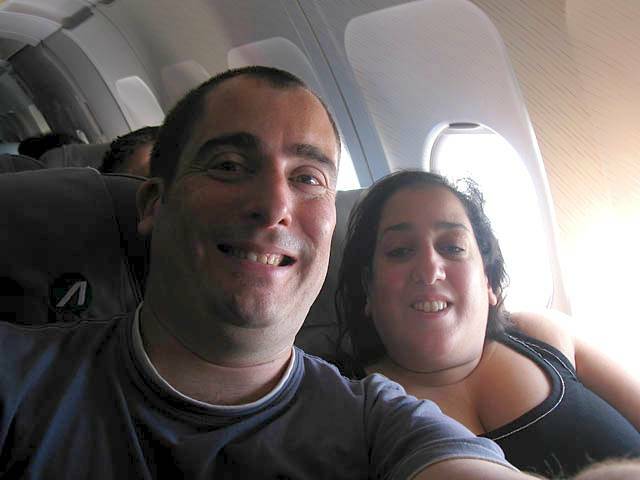 Our first airplane ride together! 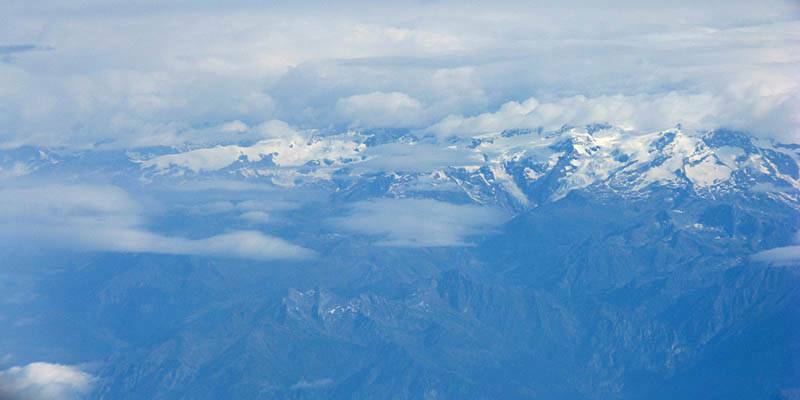 Flying over The Alps from France to Italy, including a nice vertical panorama, and a view of the higher snowcapped peaks. A smooth journey saw us arrive at Rome bang on time. 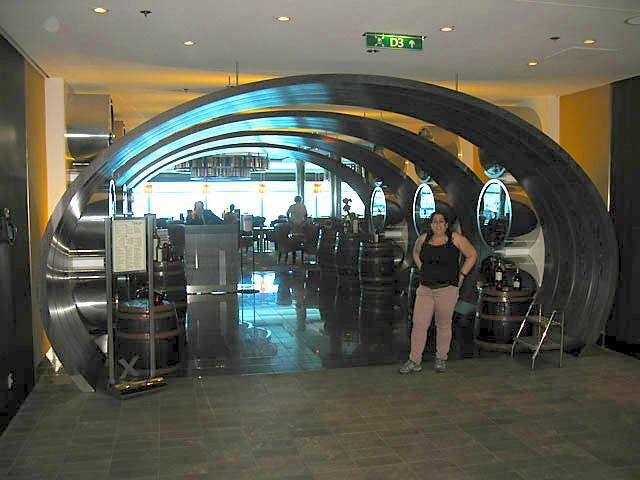 Celebrity were impressively well organised at the airport. We were intercepted by Celebrity officials in the baggage claim area who guided us to coaches and collected the cases to transfer separately to the ship by truck. We had a pleasant 1 hour drive North through the Italian countryside along the coast, passing olive plantations amongst other things en route. 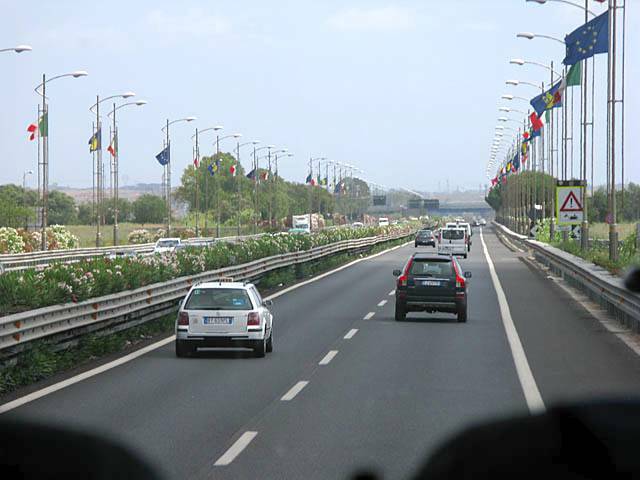 Driving along the autostrada from the airport to the port. A shame we didn't get to see Rome itself but never mind. 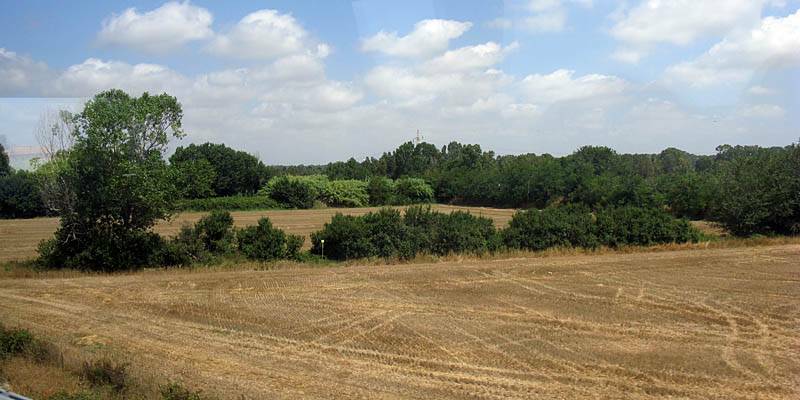 The Italian countryside. 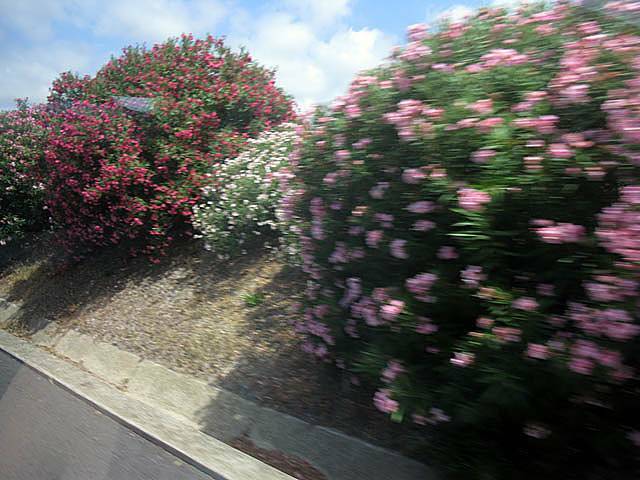 Oleander plants adding colour to the sides of the autostrada. 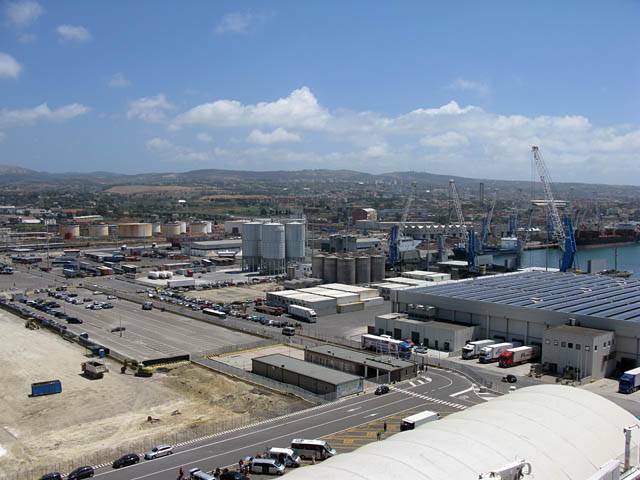 Seeing the ship for the first time as we arrive at the port of Civitavecchia. 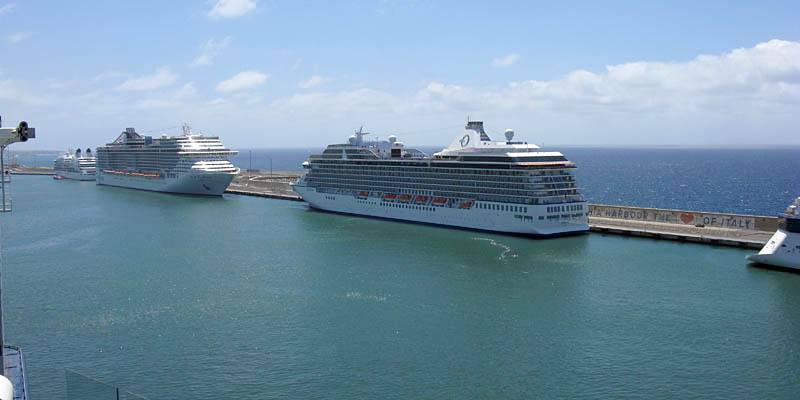 At the port it was a very busy day with 4 huge ships docked including Equinox. Checking in and boarding was simple, quick and a breeze after the air bound leg. 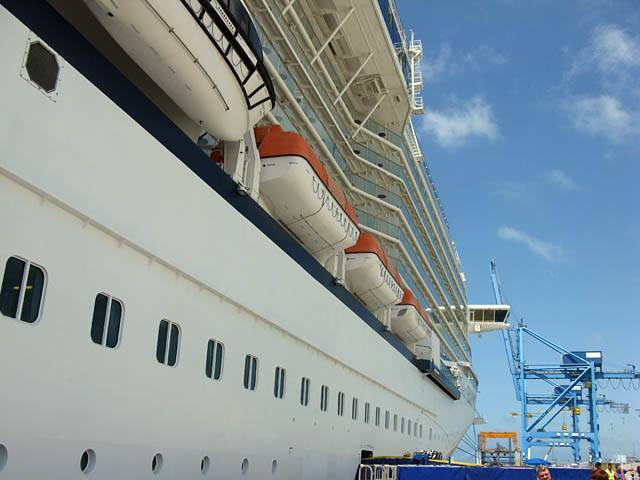 We then explored the ship, starting at the top and working our way down. We stopped at the Oceanview Café for some food when we passed it. The Vegetable Pad Thai was especially nice, as well as the various breads and other nibbles. 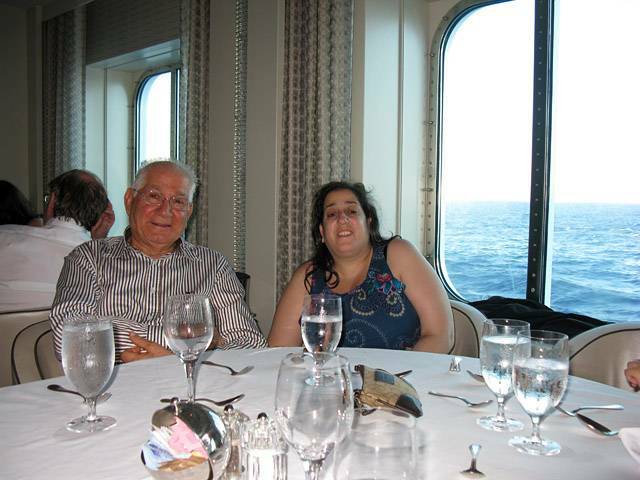 Then after a rest for an hour in the stateroom we attended the mandatory drill at 4pm. 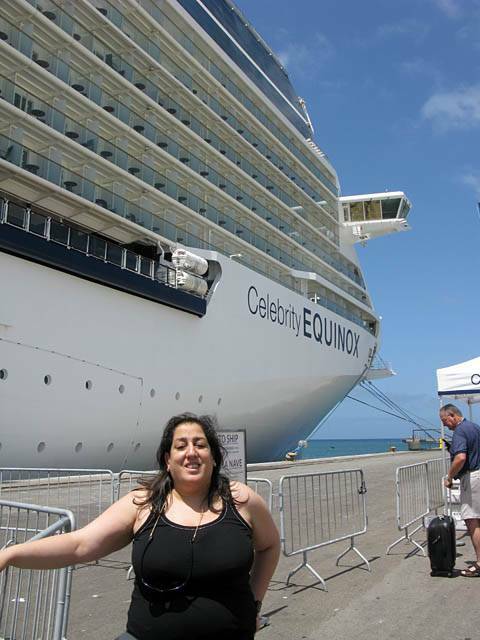 Renée in front of the starboard bow of the Celebrity Equinox. 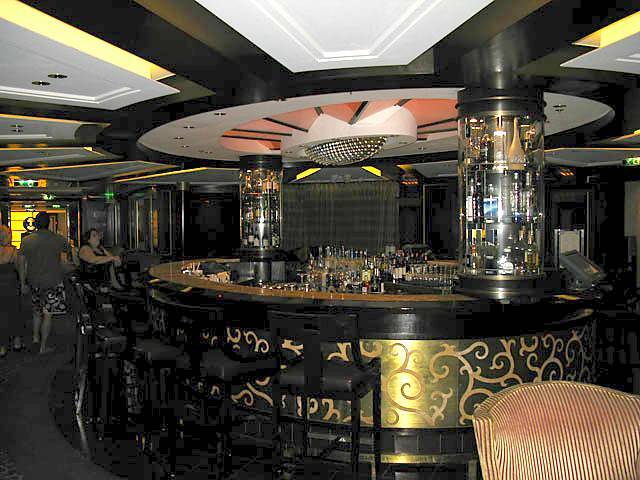 Looking up and down the starboard side of the Celebrity Equinox. 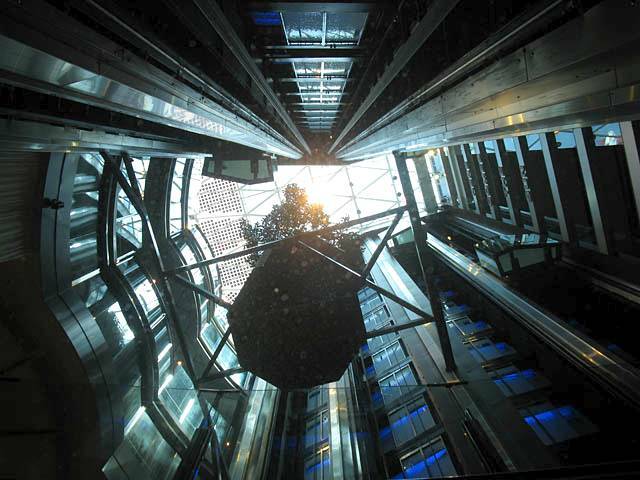 Looking up as we ascend a glass walled lift from Deck 2 where we boarded. Up top we get a good view of the other nearby cruise ships, including the Celebrity Solstice, which is the Equinox's sister ship. Renée on Deck 14. 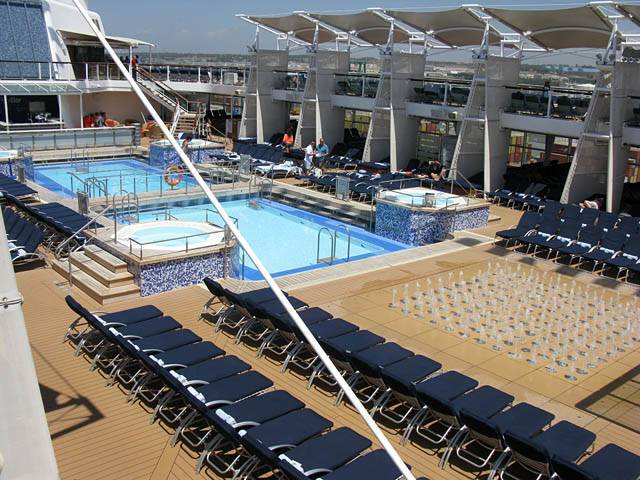 The swimming pools and jaccuzis on Deck 12. 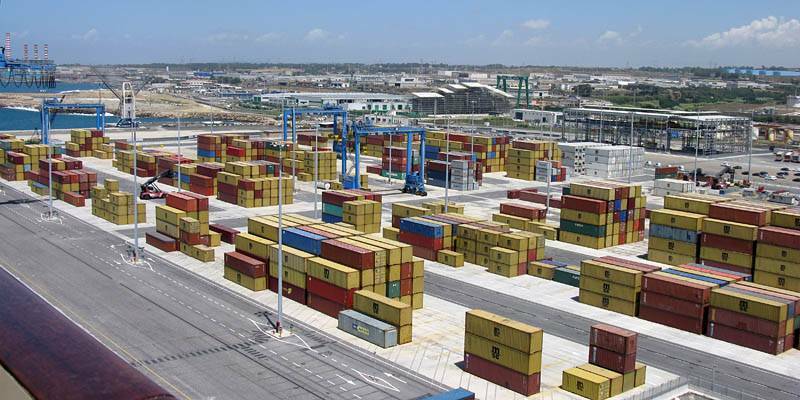 Looking out across industrial areas and a container port. 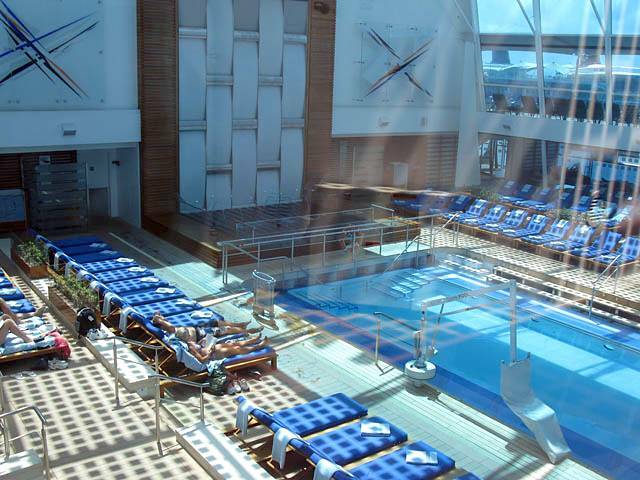 There is another indoor swimming pool - the solarium. 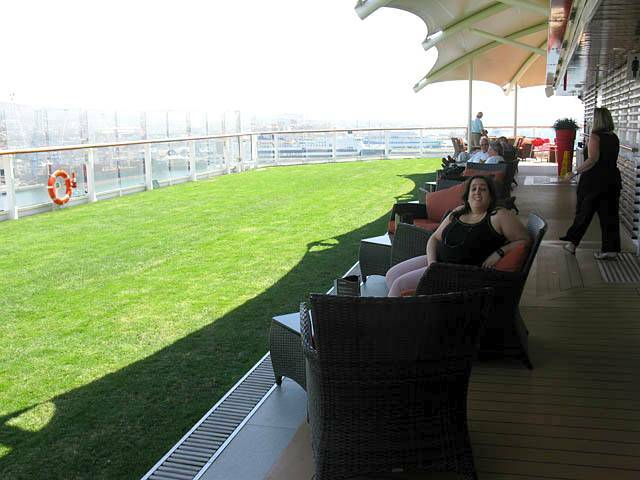 The Lawn Club on Deck 15 at the rear of the ship. 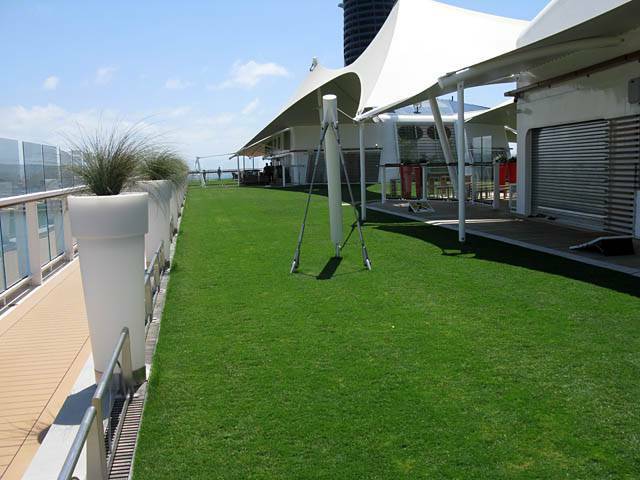 Yes that's real grass! 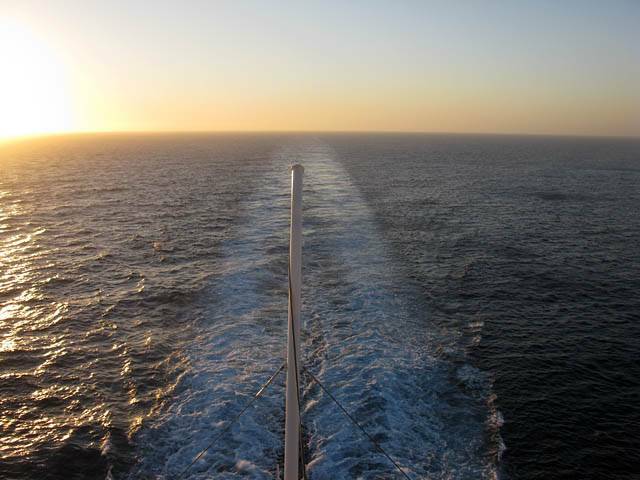 Looking out from the rearf of the ship on Deck 15. 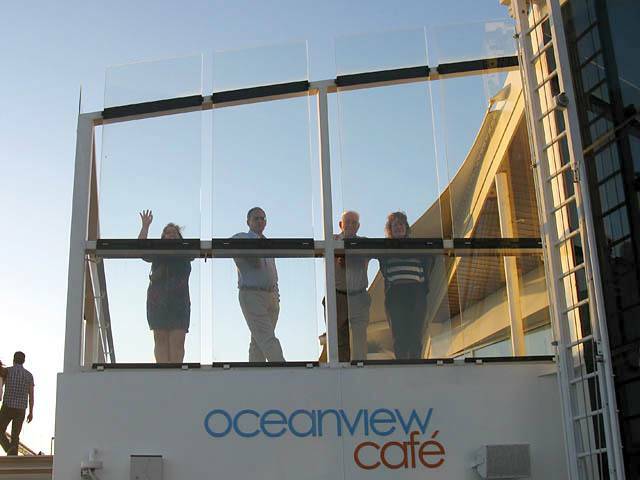 The Oceanview Café. 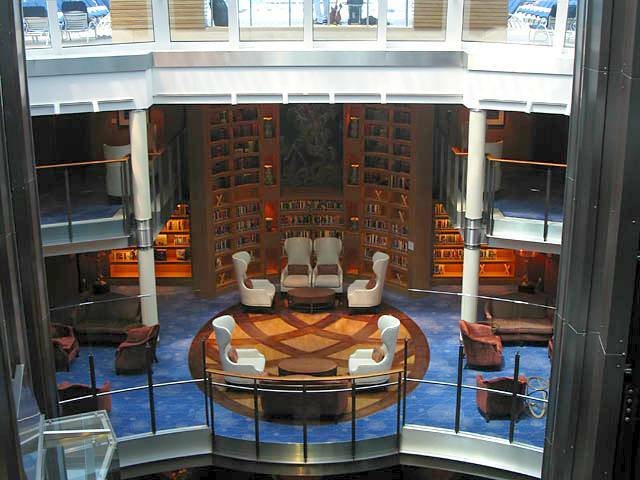 The library (Decks 10 and 11) as seen from the lift. 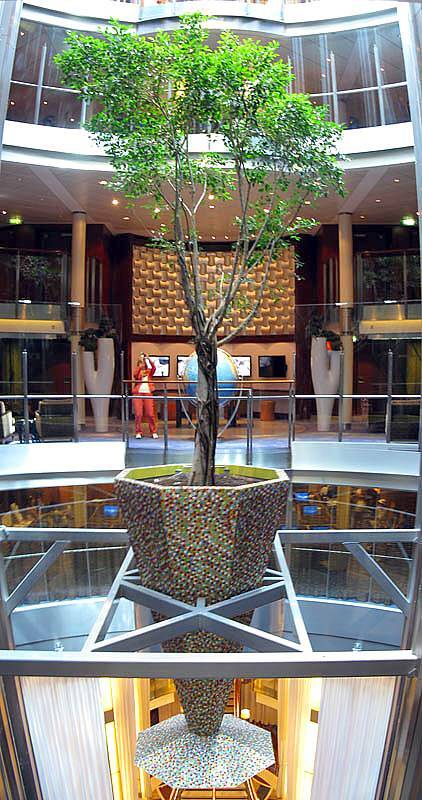 A potted tree above the main hall. 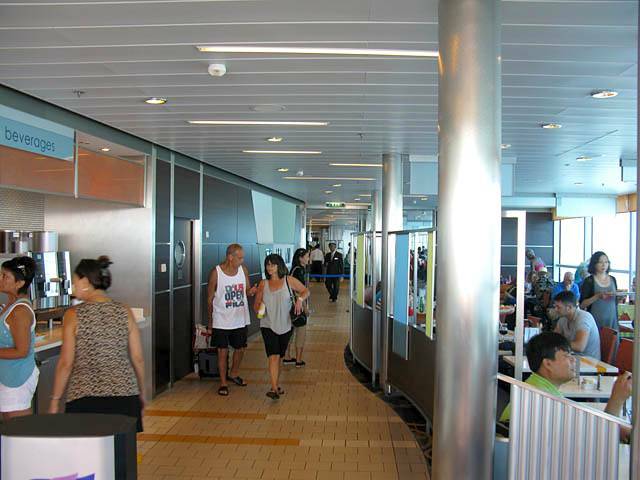 The lift is at Deck 7, across from 'Team Earth'. 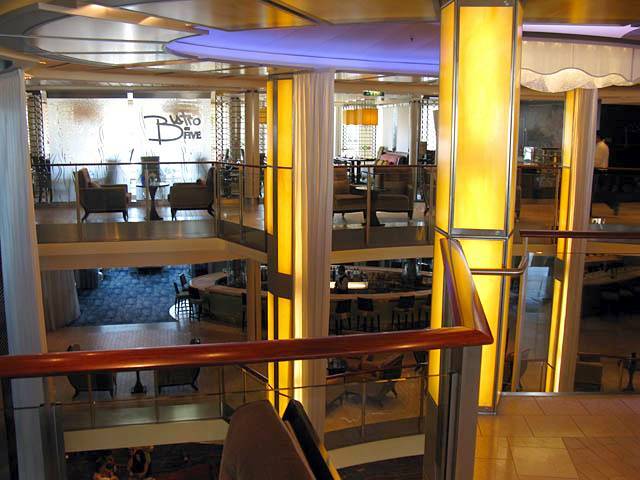 The internet area can be seen on the deck below. 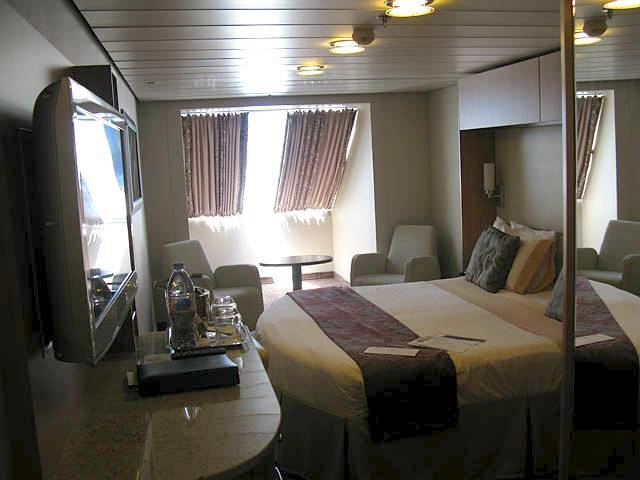 Our first look in Staeroom 7102 at the front of Deck 7. 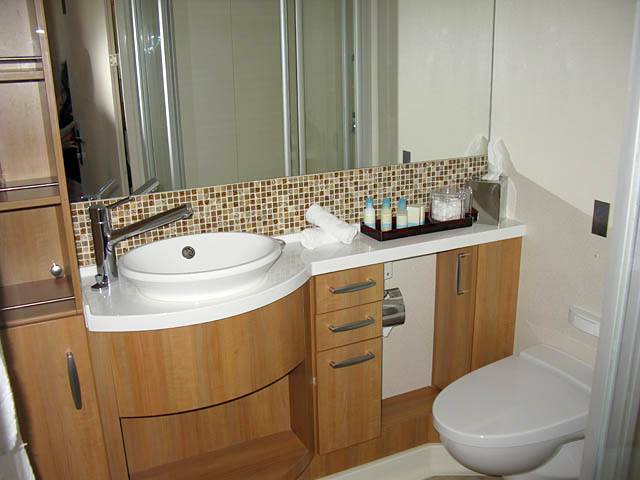 A nice cosy spacious room and decent bathroom. A nice view forwards out of the window over the helipad. Looking back across the room from the window. 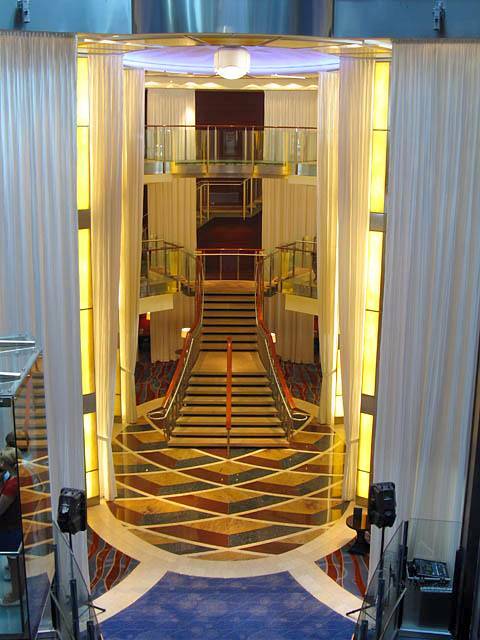 The grand staircase (Decks 3-5) as seen from the lift. 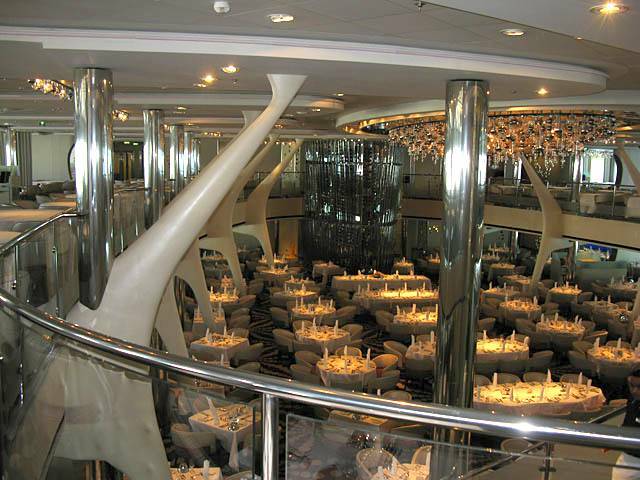 Looking across Deck 5 to the Bistro. 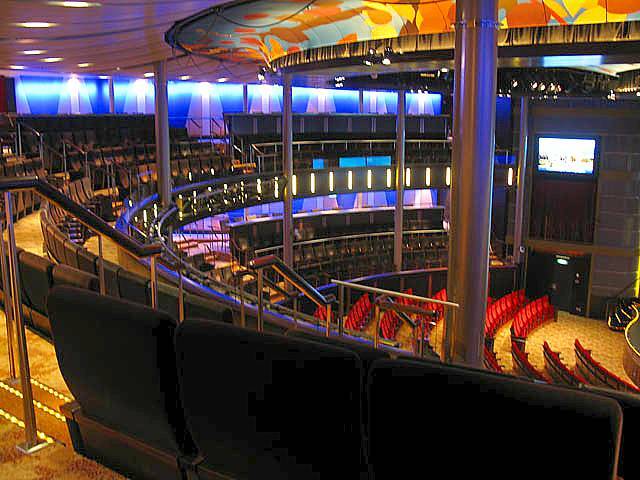 The Equinox Theater at the front of Decks 3-5. 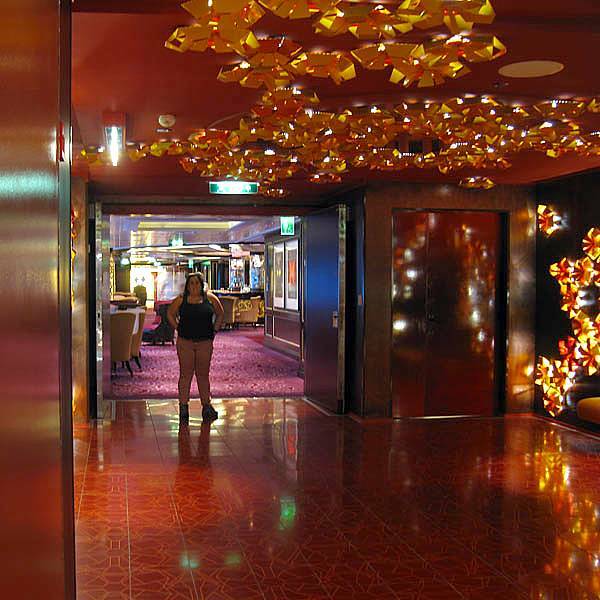 The gallery was at Deck 5. 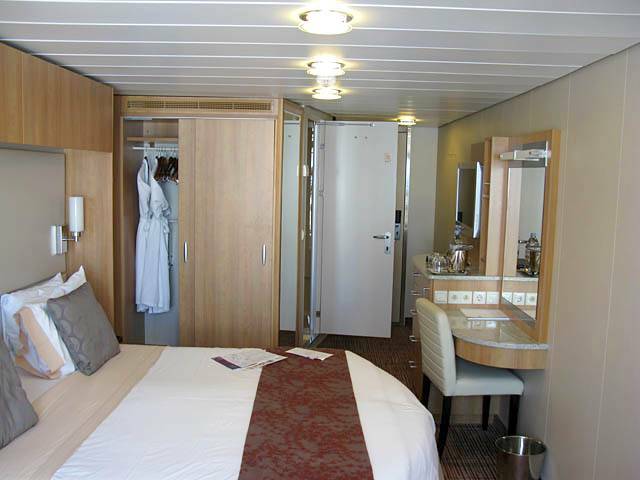 The stalls were entered from Deck 4. 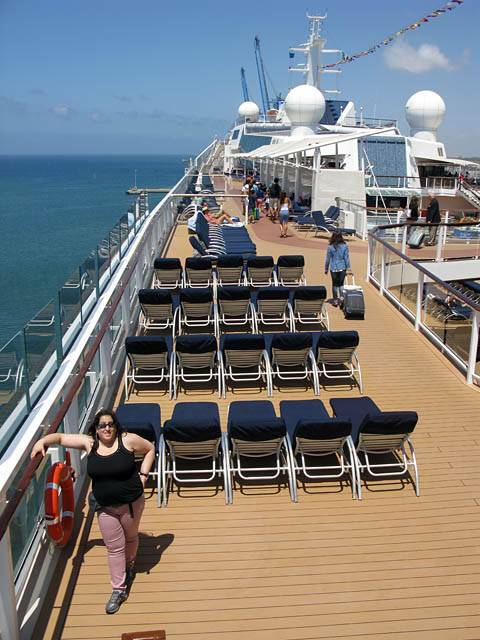 Looking around the back half of Deck 5. This was where the poshest restaurants (that you have to pay extra for) were. 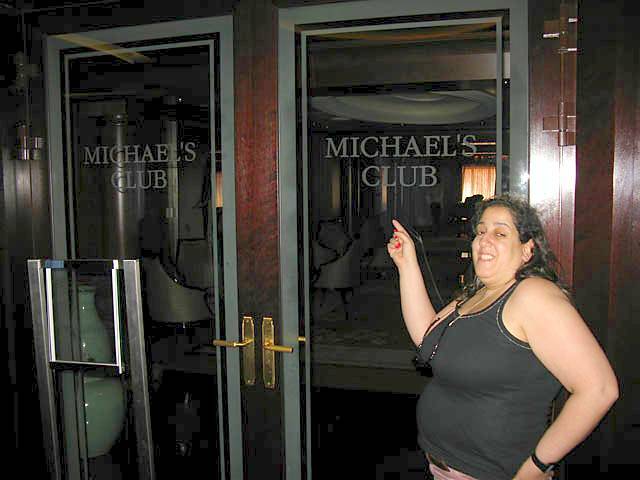 Oh look I have my own club! Yay! 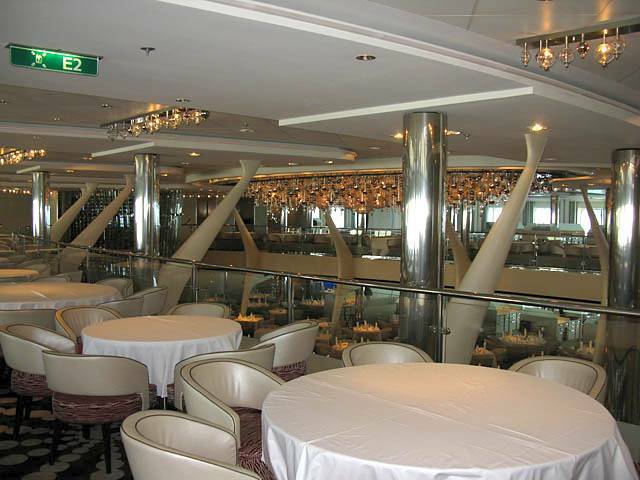 Looking around the Silhouette dining room at the back of Decks 3-4. 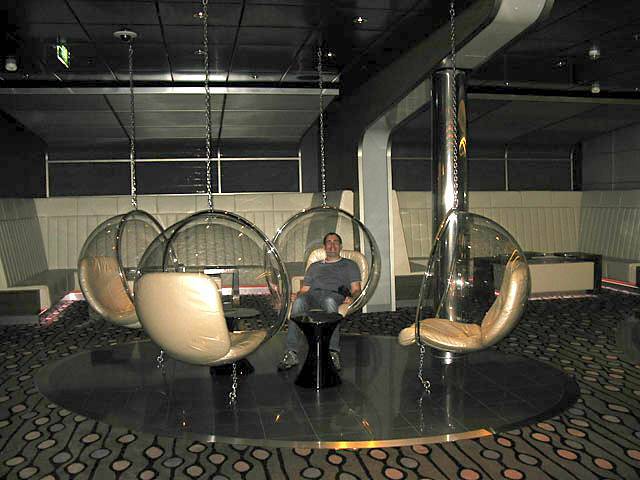 Some funky chairs in the Quasar nightclub near the front of Deck 4. 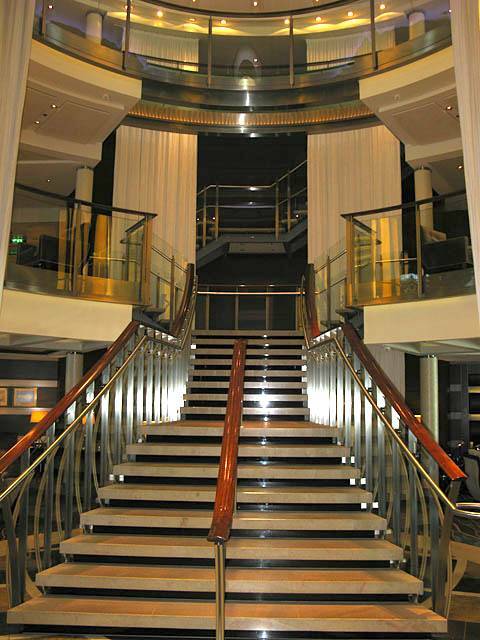 Looking up the grand staircase from the main hall near the back of Deck 3. The Equinox Theater filling up for the mandatory drill. 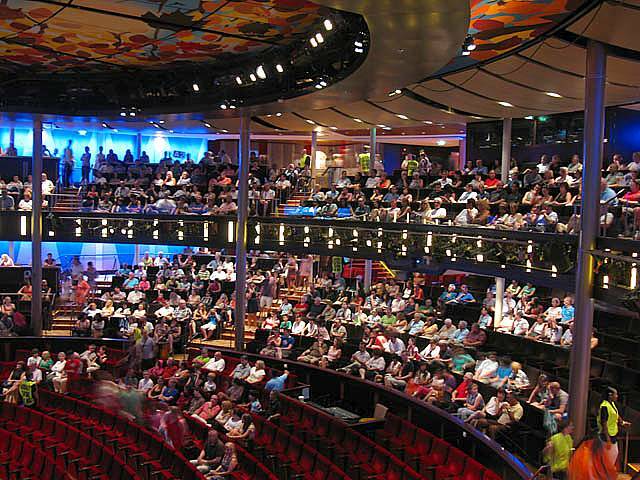 At 4:30PM we went back to the Oceanview Café for tea and ice cream and then watched from the front at Deck 15 as the ship departed the port. 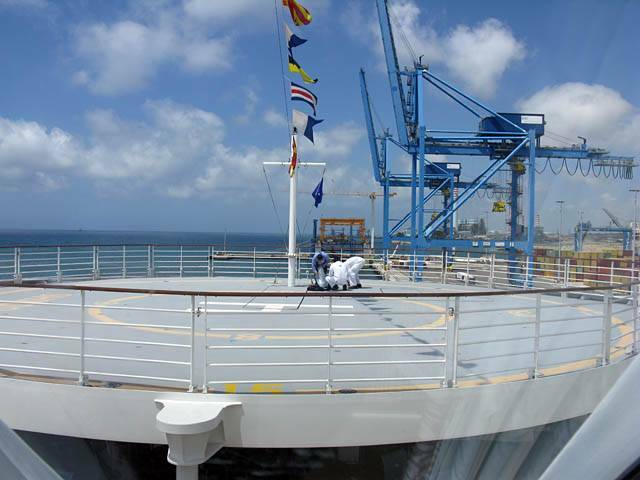 A 180 degree panorama at the back of the ship before we departed. 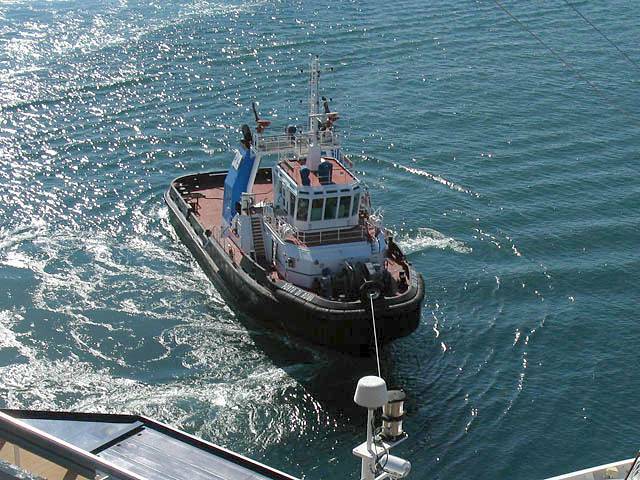 A tug boat preparing to pull the ship away from the pier. 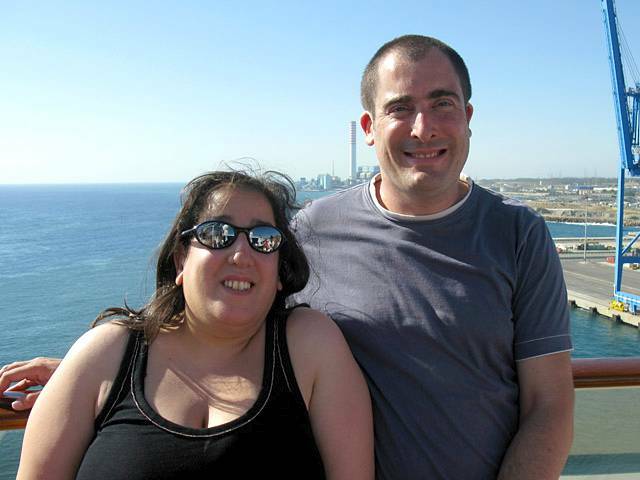 Renée and I at Deck 15 forward. 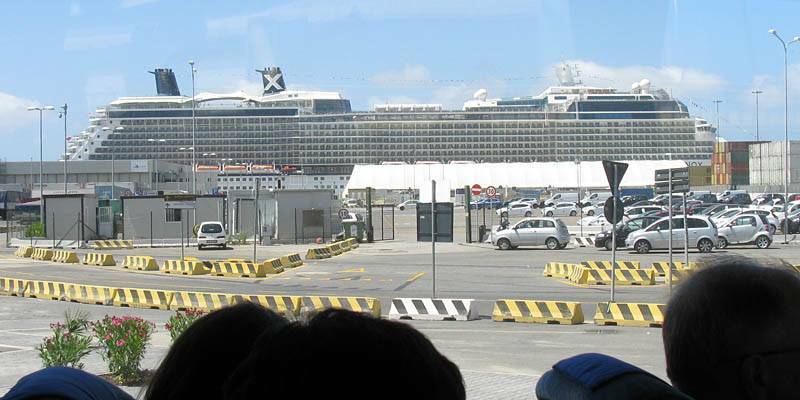 Looking back along the ship as we sail out to sea to start the cruise. Then at 5:40PM we returned to the room where the cases had finally been delivered. So we got into smart clothes for the evening meal. On the way down we stopped at the shore excursions desk so Renée could book the Exploration of Pompeii trip. (The Turkish Bath trip had been cancelled so wasn't available any more.) 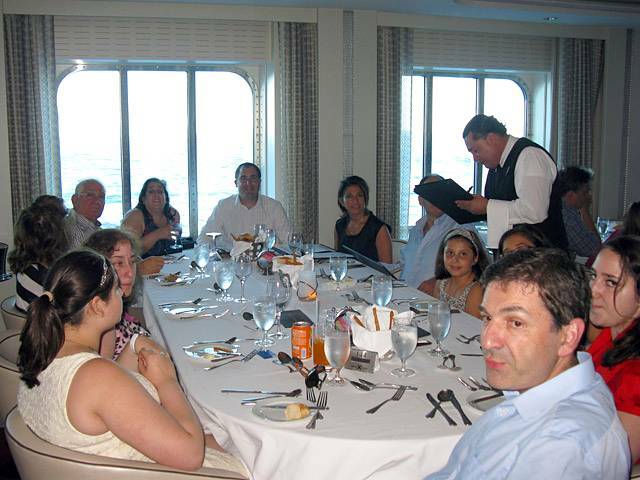 We then went to the Silhouette dining room for 6:15PM for a nice evening meal with Renée's family. I had a tasty Vegetable Korma. Renée and I silhouetted by a bright window but ready for supper. All 12 of us sat down and Louis the waiter taking orders. From left front clockwise: Amanda, Jane, Arlett, Joseph, Renée, Mike, Joy, Robert, Lisa, Natasha, Gemma and Gary. 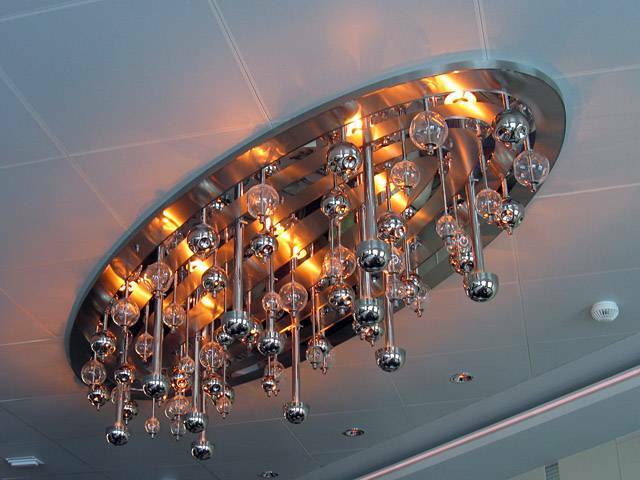 A closer look at some of the arty fixtures. 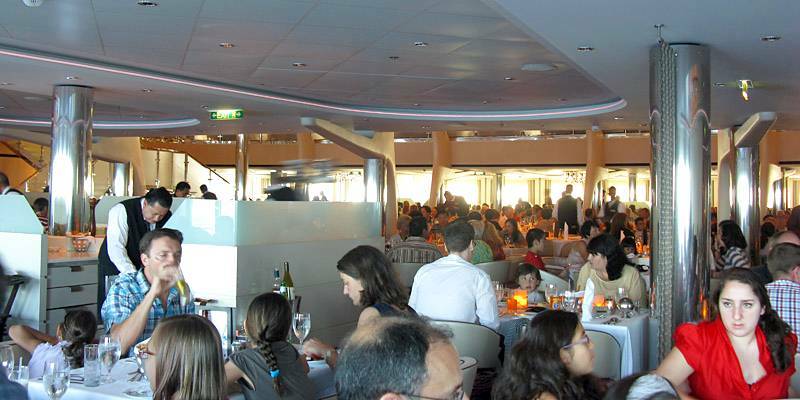 The dining room in full evening flow. Joseph and Renée. 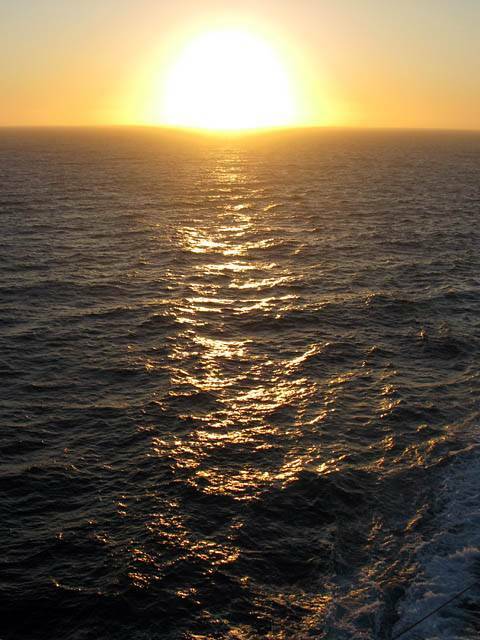 After supper we had a further wander and saw the sun get low as we cruised on way out to sea. 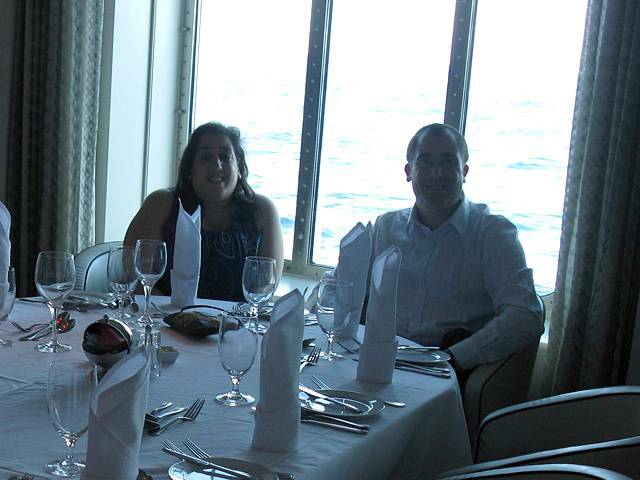 Renée, Robert, Joseph and Arlett at the front of the Lawn Club on Deck 15. 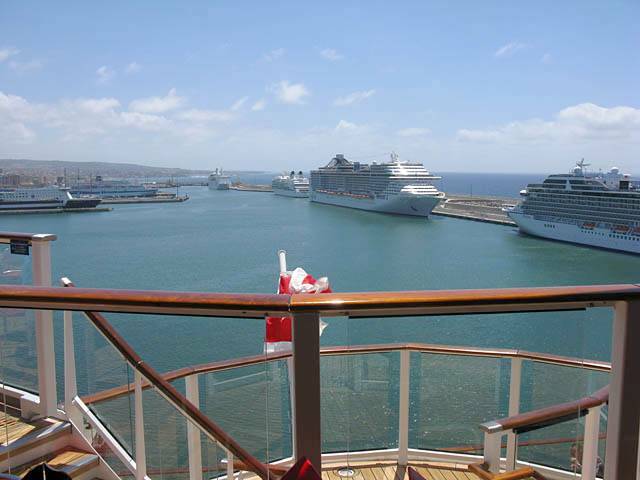 Looking back from the back of Deck 15. 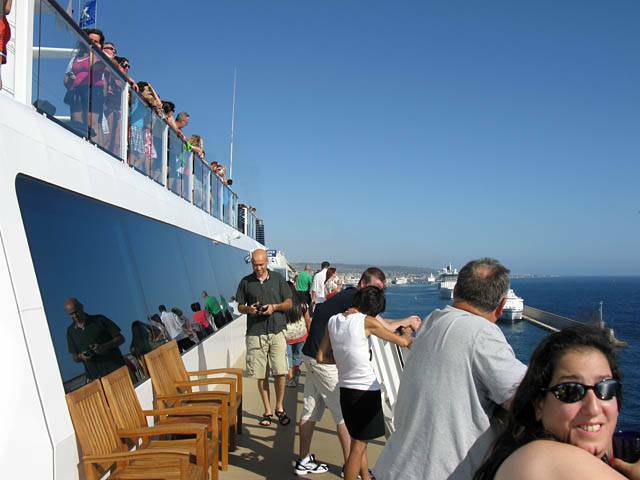 Renée and I on a balcony between Decks 14 and 15 at the back of the ship. The last picture of the day just before sunset. We retired to the room by 8:30PM to get ready for tomorrow's trip to Mount Etna and have an early night. We were knackered after such an early start. I managed to fill my camelbak and squeeze it into the minibar fridge. Nice!